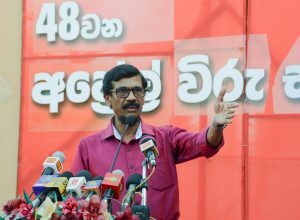 If adopting the 20th amendment presented in Parliament by the JVP in a bid to get the executive presidential system abolished is further delayed the JVP will announce its final decision regarding it in May this year says the General Secretary of the JVP Tilvin Silva. He said this making the keynote address at the 48th Commemoration of ‘April Heroes’ held at Anuradhapura yesterday (5th). Speaking further Mr Tilvin Silva said the JVP would contest the presidential election as a people’s movement if no measures are taken to adopt the 20th amendment in parliament and abolish the executive presidency.